We are a charitable organisation that exists to reduce poverty and inequality in London. We do this by funding the voluntary and community sector and others, as well as by using our own expertise and knowledge to support work that tackles poverty and its root causes. We recognise the freedom and responsibility that spring from our endowment and our independence from Government or vested interests. We seek to use this freedom to be creative and innovative and to take risks in responding to new or unpopular issues. We accept our responsibility to act with integrity and transparency. We are committed to working in an approachable and accessible way, listening to and learning from those that we fund. 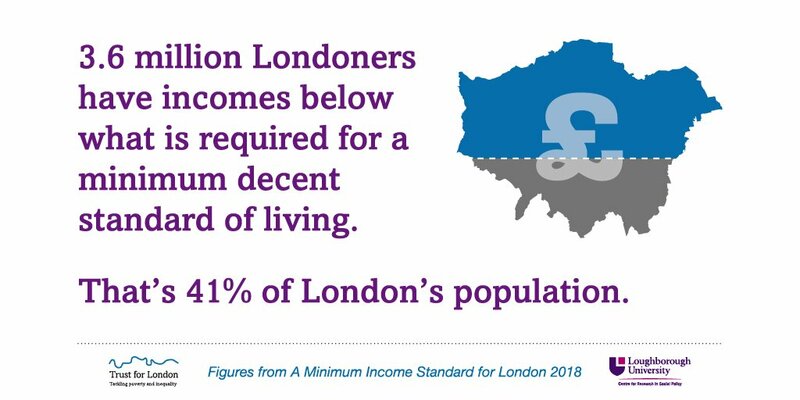 We believe that commissioning research can improve understanding of the causes and effects of poverty and inequality in London. We look to partnerships, particularly with other funders, to help us to increase the impact of our work. In all we do, we expect our Trustees and staff to work ethically, collaboratively and with open minds. Trust for London is a registered charity No. 205629, administered by Trust for London Trustee (a company limited by guarantee No. 5258789 and a registered charity No. 1107172). Registered Office: 4 Chiswell Street, London EC1Y 4UP. Ultimate decision-making at Trust for London is the responsibility of the Trustee Board whose members are nominated for initial five-year terms. Efforts are made to ensure we have a wide range of experience and backgrounds on the Board. The Board has a number of standing committees dealing with specific aspects of our work including grants, asset allocation, estate, finance & resources and investment.